Captain America: The Winter Soldier opened several weeks ago as I write this. I saw it opening weekend. So why am I just writing this now? I just got back from seeing it in the theater again. I can only think of one other movie I’ve seen more than once in the theater in the last decade if not longer, and I’ll get to that later. Let me sum it up simply: it’s a brilliant movie. I absolutely loved it. It was everything I’d want in a superhero movie. Fantastic action, great characters that are true to the versions I love from the comics, and a great plot. There were also some very enjoyable Easter Eggs for characters that have both appeared before and not yet popped up. The action: there were great fight scenes and stunt sequences. Some of the best fighters in the Marvel Universe are in this movie, after all, so that makes sense. Captain America, Black Widow, and Bucky/Winter Soldier are all near the top of the food chain as far as hand to hand goes. They also were mercifully restrained in the “unsteady cam” as I call it, that makes it look like the poor camera operator is getting beaten up in the course of the fight. This Cap was fantastic. He describes himself perfectly at one point, saying, “I always try to do the right thing.” That’s Cap in a nutshell. His speech near the end when he’s rallying the SHIELD agents was the inspiring, noble hero who, with no powers, manages to lead a team that has included gods, demi-gods, androids, and aliens. That’s who I wanted Superman to be in Man of Steel, and he so very much wasn’t. Black Widow was the spy comfortable in grey areas, but still on the good side. In the comics, she started as a villain, and she has the questionable background here, too. She’s a lot more ruthless than Cap, and they even play off that in one of their interrogation scenes, and I think they do it very well. Falcon got introduced here, and he was a great addition. He’s the most different from his comic incarnation, but the changes worked. He’s Cap’s partner, and a brave, dedicated hero in his own right. Even in the midst of combat, he was reveling in the joy of flight and the rush of action. At the risk of sounding like a broken record, this was the kind of joy that was almost utterly absent from Man of Steel. Fury, the master spy and planner, finally got to do something aside from walk into a room and look cool. And, as usual, even half-dead, he was several steps ahead of the bad guys. The Winter Soldier was a great adaptation, with minor alterations from his comic version, but these, too, worked. The plot managed to show Cap as a hero with an unwavering commitment to being a good guy. It could have been corny, it wasn’t. It tied into the modern age of the War on Terror very nicely. Captain America is supposed to be the inspiring, moral center of not only the Avengers, but the Marvel Universe, and that’s who is here. There mentions of most of the other Avengers, one way or another. Tony Stark/Iron man came up three times, as well as on a target list near the end. Bruce Banner, the Hulk, was mentioned at least twice. Hawkeye was apparently represented in a very indirect way: Widow wears a necklace throughout the movie. If you look close in a few scenes, you can see it’s an arrow. I don’t know what else that could possibly refer to but the Avengers’ archer. They even mention Dr. Stephen Strange, Marvel’s Sorcerer Supreme, who hasn’t been in any Marvel films so far, but is rumored to be in contention for a solo movie. Marvel has done a fantastic job on their movies, and this was one of the best. I mentioned one other movie I’d seen twice in the theater? It was Avengers, which is also not only one of the few movies I own, but the only one I’ve bought on the day it came out. Ok, I don’t think it was perfect, but my picks are minor. The line they showed in almost every trailer, with Steve saying, “All the guys in my barbershop quartet are dead,” doesn’t make a lot of sense to me. He was a scrawny kid, then a war hero. While they apparently expanded his wartime role beyond what we saw in First Avenger, all that time he sounds like he was in action in Europe. When would he have joined a singing group? My other minor dislike is how much they’ve made him more than human. He’s supposed to be the peak of human perfection, but this version is much more. He knocks people yards with a single punch, jumps and/or falls many stories without injury, and smashes through walls. When Marvel and DC do their occasional cross-overs, there are the inevitable fights. Batman is most often paired up against Captain America. This version would be a lot less better match in that regard. 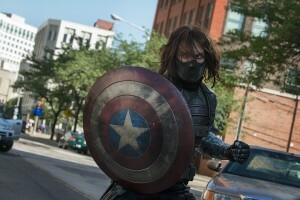 Winter Soldier is a fantastic movie. I hugely recommend it. I give it a very rare 5 out of 5 stars.